Things are nearing completion at Turtle Lake. It is so exciting to see it all come together. The back hallway was repainted the correct color and looks awesome. We've started moving some items in. This coming week, we will have a load of furniture from our present house moved and then new furniture is to be delivered this week. So, I'll have some great interior pics next week. The most exciting news this week is that the LEED rater came to inspect the house. 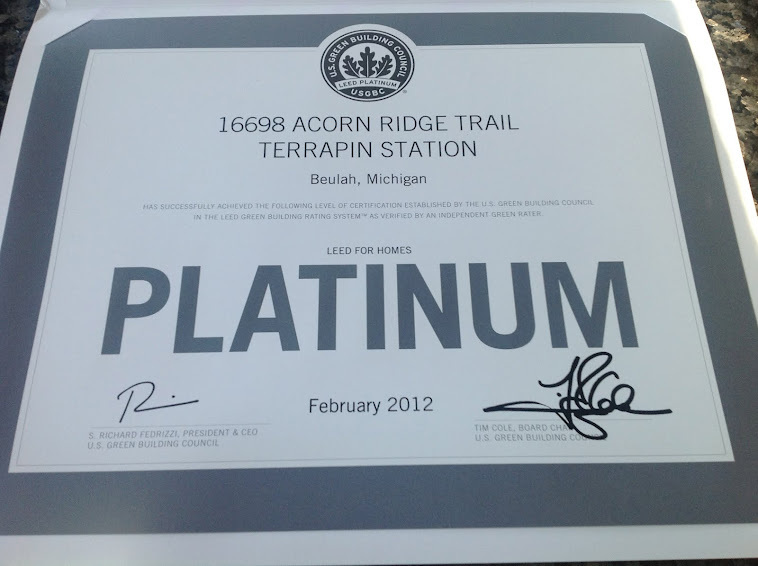 We are hoping to achieve Platinum LEED certification, which is the highest achievable level. Part of achieving Platinum is the HERS score. HERS stands for House Energy Rating System and it is the level of energy efficiency our house has achieved The lower the score, the better. Well, our initial score is 36 and it will most likely go below that once the final Geo-thermal specs are reviewed. We also have enough points so far to achieve Platinum. The lowest level our LEED consultant has achieved so far is 34. Be sure to check out the Education session on the right side of the blog for more information on HERS and a picture of the rating scale. We are so excited for you! Met with Joel yesterday at his home in GR. It is awesome, with so many beautiful finishes, especially the different woods. Thanks for the referral. Congrats on your LEED rating! I was just doing a search for images of Turtle Lake and saw your website about your cottage! I purchased an acre on Turtle Lake in 2009 - Lot 18. I noticed in November that you were building! It is such a beautiful cottage - I hope to meet you this summer and maybe get some tips for building green in the future. I won't be able to build for a couple more years, but my intention was to use green and/or all recycled materials. Your website and photos are an inspiration!